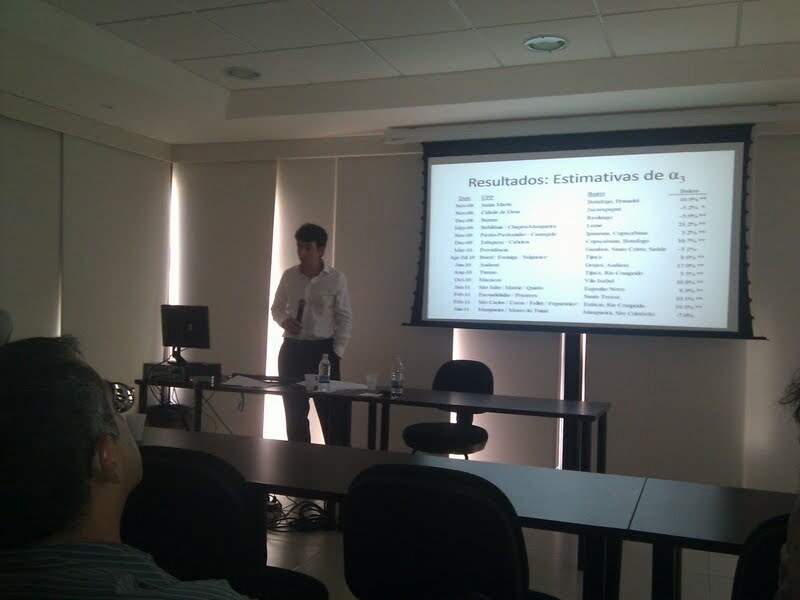 An unlikely duo presented a striking new economic paper today at the Getúlio Vargas Foundation in Rio de Janeiro, that will be of great interest to those researching gentrification, among other areas of study, in favelas and areas contiguous to them. Benjamin Mandel is a young American economist who enjoys quite a bit of research autonomy at the Federal Reserve Bank in New York. Economist Claudio Frischtak is President of Inter. B – Consultoria Internacional de Negócios, with a focus on economic, strategic and financial advisory services to the private sector and government. Together, they analyzed the Zap Imóveis site data on 3.3 million housing units on the Rio de Janeiro real estate sales market, together with crime data from the Instituto de Segurança Pública. The resulting paper found that between 2008 and mid-2011, “the UPPs accounted for about 15 percent of price growth in Rio’s formal property markets, an observation which we link to the contribution of the UPPs to falling crime rates”. The economists also found that the post-UPP drop in crime led to greater increases in value for lower-priced housing, than for higher-priced housing, reducing price inequality. For example, after the installation of a UPP covering Cantagalo and Pavão-Pavãozinho favelas in Copacabana and Ipanema, housing on either end of the Rua Saint Roman, which runs through both, has probably seen larger percentage price increases than apartments on Avenida Atlântica. This reduction, the authors claim, means reduced inequality in wealth, because for all social classes real estate is a key element in personal wealth. The results for their version of the income inequality Gini index, they add, illustrates “a potentially significant new dimension of policies aimed at reducing either crime or inequality.” Existing attempts to ameliorate economic disparities tend to focus on income transfers; policies to reshape wealth distribution in any meaningful way are uncommon. Such a finding, they add, may be useful in policymaking elsewhere. The research didn’t include real estate price data on favela housing. If it had, commented FGV economist Marcelo Neri, both findings are likely to be even stronger. Those who own property on Rio streets such as Rua Saint Roman need no economist to tell them that a UPP is welcome news. Many units were degraded or underutilized for decades. Now workers are digging and banging everywhere. In the South Zone, tapas bars and hostels are springing up at almost the same pace as the corner bars, pé sujos, are disappearing. While white elephant owners have finally joined the market, the boom has created problems for other cariocas. Buying property — and especially renting an apartment– have become something of a missão impossivel in much of the South Zone. And aside from the fact that few favela homeowners hold title to their newly-appreciated assets, which to some extent inhibits liquidity, there is no policy protecting those being pushed out by the real estate boom, both in favelas and the formal city. Clearly the new public safety policy is changing the geography of Rio, and architects, builders, engineers and moving companies are on a roll. What remains to be seen is just who will end up living where. Coverage on this study in the Estado de São Paulo newspaper is here. This entry was posted in Brazil, Transformation of Rio de Janeiro / Transformação do Rio de Janeiro and tagged crime reduction Rio de Janeiro, gentrification Rio de Janeiro, pacification Rio de Janeiro, public safety Rio de Janeiro, real estate Rio de Janeiro. Bookmark the permalink. Thanks, Julia, for posting this! I did a much cruder version of this same analysis for my research, but good to know I was at least on the right track! I wish someone would seriously start systematically tracking real estate values in the informal market – I think the findings would be very useful in guiding policy! It seems so far all anyone has is anecdotal / ethnographic data.